We think of bears as eating honey—but their omnivorous diets are quite diverse, vary regionally and shift through the year with food availability. Food is often limited in the early spring, as warming air melts the delicate snow crystals slowly unveiling a world buried by winter. Hungry bears scavenge for frozen berries, carcasses of deer, moose and other animals killed by the harshness of winter and preserved in her cold embrace. 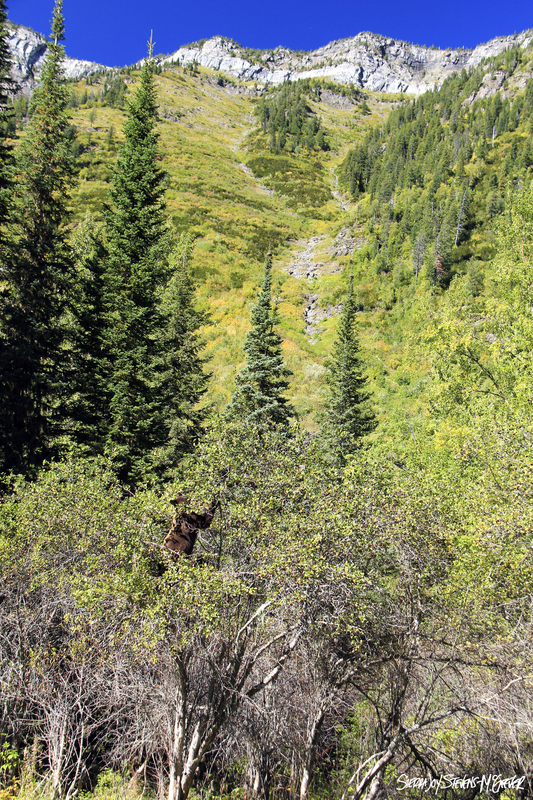 As the first greens of spring push up from the ground in expansive meadows and along the edge of gurgling streams and rivers brimming with snowmelt, bears will frequent these natural buffets rummaging for food, uprooting plants just as they spring to life. Grizzlies, with their strong shoulders and longer claws, are better suited for digging for roots and bulbs. In a day, a single grizzly can tear up a patch of meadow equivalent to a football field uprooting and devouring the bulbs of glacier lilies. Coastal bears scavenge for the remaining orange flesh of salmon that perished the previous fall, after devoting all their life-force to migrating from the ocean upstream to their birthplaces and reproducing the next generation. Some bears catch fresh fish or hunt small animals. Lucky bears find honey. Early spring is a lean time, and most bears continue to lose weight into June when the dwindling snowpack yields and greenery spreads. Summer is a time of plenty. Bears find green foods abound along rivers and streams, in sprawling meadows bursting with fragrant wildflowers, in soggy marshes, and on slopes wiped clear of swatches of forest by the cascades of winter avalanches. Bears snack on ants and beetle larvae unearthed in rotting logs. Bustling bees and other hungry insects inadvertently pollinate flowering berry bushes, trees and vines in their own search for food. Petals fall from pollinated flowers unveiling the promise of fruit. As summer progresses huckleberries, sarsaparilla, blackberries, buffalo berries ripen and offer sweet treats to birds, squirrels and eager bears. The heat of summer dwindls and days contract their length. Trees draw the chlorophyll from their leaves, storing the precious life-force for warmer times to come. Each leaf transforms from the vibrancy of summer green to golden, orange and red, finally falling to the forest floor in piles of colorful grandeur. As deciduous trees prepare for the winter dormancy, so do the bears. 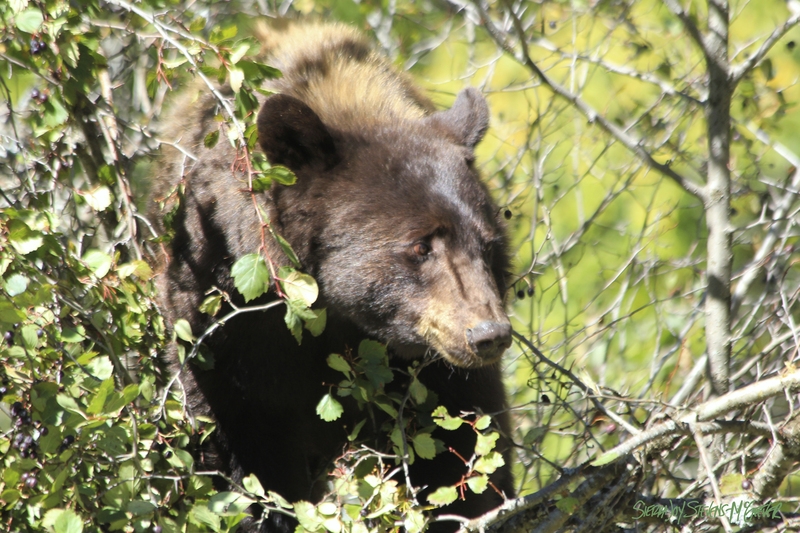 In mid-October, one black bear shook the branches of a huckleberry tree as it climbed higher, picking berries both with short-clawed hands and with a long golden snout. Sunlight danced on its brown forehead, its eyebrows furrowed slightly as it blinked into the sun. Fluidly it reared up to grab the berries overhead, the tree creaked slightly, the sun shown on the bear’s golden back, berries disappeared in rapid succession. Soon the berries would succumb to frost. Soon the bear would turn back to feasting on greens and roots. Soon it would search for nuts and hunt small game and fish, in a stage of hyperphagia, packing on as much fat as it could, before retiring for the winter. But today the sun shared its warmth, today the last huckleberries remained, today I watched the bear in perfect silence. The common name, huckleberry, can refer to a number of different species in the Ericaceae family all with small round berries, similar in appearance to blueberries, and ranging in color from purple, to deep crimson, to blue, to red. American Black bears, Ursus americanus, vary in color from jet-black to deep brown, cinnamon, blonde and occasionally white. The commonality of each color changes with location. East of the great planes, most bears have black fur. The melanin in the black fur makes it more resistant to abrasion in the bushy eastern forest understory. In the west, where forests are more open and mountain meadows are common, bears are usually lighter in color. Light fur reduces heat stress caused by spending time in the sun allowing bears to feed for longer in open areas rich in food. To the north, rare white and blue-grays bears can be seen. If Winter is a woman, then what gender is Summer? An entertaining and informative read.